On 4-5 December 2018, the Danish Meteorological Institute (DMI) is hosted a workshop on crowdsourced data in numerical weather prediction (NWP), attended by Joanne Waller and Sarah Dance from the DARE project. DMI hosted this workshop with two aims, 1) Gather experts on crowdsourced data focused on NWP, to start a network of people working on the subject and 2) producing a white paper directing the research community towards best practices and guidelines on the subject. Presenters from the University of Washington (Seattle), University of Reading and several operational weather centres including the Met Office (UK), German Weather Service (DWD), Meteo France, ECMWF, KNMI and EUMETNET gave us status reports on their research into using crowdsourced data, opportunistic data and citizen science. We discussed the issues arising in the use of such data and agreed to write a workshop report together to feed into EUMETNET activities. 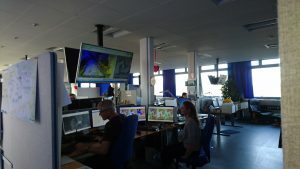 We also enjoyed a fascinating tour of the DMI operational forecasters centre.